"meet you out at the river"
Location. Sontag Rd headed west off New Ballwin Rd. It was 18,000. square feet in size, in the shape of a half moon. The shallow part of the half moon shaped pool was gradually sloped toward the roped deep water area. It started out at the depth of about 8 inches and gradually sloped to the depth of about 3 feet of water, before coming to the ropes, which were hooked to iron posts at the edge of the deep water. When you entered the deep area of the pool the bottom quickly sloped downward to a depth of about 7 feet. As you approached the diving boards in the deep water, the floor continued to slope to the depth of 10 feet, especially around the high diving board in the middle of the deep water. The pool had 1 10-foot high diving board with 2 low diving boards on either side. The water for the pool came from an artesian spring that flowed through a mineral deposit of salt. The spring was tapped, and a release valve was opened weekly to change the water in the pool. Some people described the smell of the water as it entered the pool to be like rotten eggs or sulfuric in nature. The owners relied on the sun (& rain) to warm up the water each week. The St. Louis County Health Department tested the water and found it to be healthy and even beneficial to wounds on the skin. However, they still required the owners to add chlorine to the water for regulatory puposes. The pool became a popular attraction to Castlewood in the 50's and 60's. During the height of racial tensions, it became a private pool, requiring season passes purchased by its members. The motive of this venture was to prevent minorities from swimming in the pool. Status: It is buried on the property where it once existed. Memory. "The high dive was 10 feet high, and it took me a long time to learn how to dive head first off of it. When I got older, and more confident in my skills, I could do "can openers" from the high dive, which made incredible splashes in the water! "Coming from a family of little means, I rarely had any money to spend at the pool.So, I became a good underwater swimmer and could hold my breath a long time under the water. I developed this skill because I would swim around the bottom of the pool in the deep water hunting for change that would fall out of the swimming suits of other swimmers. I found tons of change down there! I usually spent the money on fritos, sodas & ice creams sold at the bar in the building, and later on the pin ball machines in open eating/dancing area of the building, where the juke box was located. "The owners had installed a sound system which played the songs from the juke box on exterior speakers, which could be heard all the way to my house a half a mile away. I remember a pinball machine called "Slick Chick" that I loved toplay, because if you scored enough points the special red lights would light up, and you had the chance to win free games, lots of them. When you shot the ball down a certain hole, the machine would rack up a bunch of free games. It was like you hit the jackpot! I loved it! 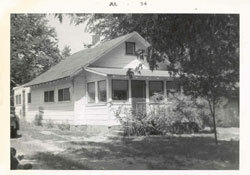 "I remember the brown painted wooden floors in the building and the round bar in the front room at the entrance of the building, where you could buy sodas, chips, snacks, and other items.The bar area had wood paneling on the walls, giving it a dark cool effect, with a screen door on the front entrance to the building. The eating/dancing area in the next room had wooden booths with screened windows located against the walls of the round room. People could come in from the sun, buy food from the bar and eat it at the booths in this room. The juke box was always playing, giving it a cheery atmosphere for the patrons. "Outside you could hear the chatter of everyone having a blast in the pool, while the sun worshippers basked in the sun on the sidewalk areas extending from the arched shape of the pool. The pool had a lot of property, including a long grass covered parking area west of the building which had a white wooden fence. On the south side of the fence was some picnic areas, a combination tennis court/ basketball court paved in asphalt. Further west was a large back stop and baseball field. The southern edge of the property was defined by the creek which ran through the property, going behind the swimming pool. The drains and overflows from the pool emptied into the creek as well via long metal pipes, which could be seen sticking out halfway over the creek, as the water slowly poured out of them. Memory. "To give you an idea where I grew up... if you continued walking up the road where Castlewood Pool was (Sontag Road), you would have to walk about a half mile before coming to a cluster of clubhouses (14) at the end of the road. My father bought one of those clubhouses [a tiny house with a sun porch, 2 bedrooms, living room, in-door bathroom, and a kitchen & utlility room on the back]. My parents raised 7 children in that house! Behind our neighborhood was the 80 acre Sontag farm. Our neighborhood began with a few "weekender" families, which included 1 bachelor, and 3 sets of couples. The remaining homes were bought up by families who lived there all year round. I'll have to tell you about Mr Simpkins, the bachelor next door, sometime. We also had Walter Vespy, the character of the neighborhood, who told my Dad about our house.I have tons of Walter Vespy stories from which to choose. Photo: Simpson residence, on Waterman, at the end of Sontag Rd, Castlewood, MO. Contributed by Chuck Simpson. a sun porch, home. At certain stages some of us had to sleep on the couch in the living room."